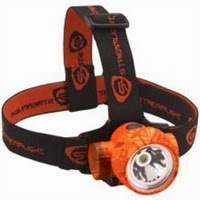 Looking for a high performance LED headlamp? Whether you’re an outdoorsman (or woman) navigating the dark, damp interior of a poorly lit cave or needing a soft glow to illuminate the pages of your book before you turn in for the night, the Streamlight BuckMasters Trident HP Headlamp is sure to be a handy addition to your home tool box or emergency kit. Optimized to provide maximum output in a single reflector/LED configuration, the Trident HP Headlamp offers white C4 LED technology with three ultrabright 5mm safety green LEDs within the same reflector and is equipped with three lighting modes to best suit your needs. Choose between using the C4 LED (2,500 candela peak beam intensity with 5 hour runtime,) one green LED (32 candela peak beam intensity with 50 hour runtime) or all three green LEDs (80 candela peak bean intensity with 22 hour runtime). Other features include a 90° tilting head, an elastic head strap and a rubber hard hat strap. Included are three AAA batteries that power the device. Like other durable Streamlight products, the Trident HP Headlamp is both IPX4 and water resistant, as well as impact resistant up to 2m. Choose between traditional yellow, or popular RealTree Hardwoods Green Camo or Blaze Camo for a little customization. This product also comes with a limited lifetime warranty. High power headlamps traditionally have a very rugged stigma, but they’re not useful exclusively to the likes of Paul Bunyan. Headlamps are an affordable and convenient item to have laying in your at-home tool box or in the glove compartment of your car. Use it for recreational and day-to-day activities like walking the dog at night on a poorly lit street. When you’re caught with an unexpected home or car repair, shine a little light on it with your trusty Trident HP to better assess the situation. Have you been left standing in the dark because you didn’t have a headlamp? Or maybe you’ve used your high performance LED for a scenario we didn’t list above. Sound off in the comments below and be sure to check out the rest of our energy efficient lighting online at Energy Saving Lighting!